RealTime-CTMS is a scalable, web-based clinical trial management system (CTMS) designed by RealTime Software Solutions LLC for research organizations looking to streamline all facets of clinical trials. It is an innovative solution that provides easy access to subject or study data via simple, intuitive navigation to boost the efficiency of research sites. The platform provides fully integrated services that aid the management of critical functions of clinical trials. RealTime-CTMS guides the user right from the study startup to the study closeout and all the other aspects in between. It features robust tools for patient recruitment, patient database management, budgeting & accounting, visit scheduling, reporting, task management, and more. 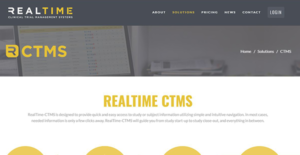 RealTime-CTMS is a reliable CTMS solution designed with all the vital tools to offer support for the entire study duration. Besides its basic CTMS remedies, the platform provides other notable solutions including payment processing, appointment reminders, data collection, and online document storage. This makes it fit perfectly in the upper echelon of all-inclusive CTMS programs that deliver all the essentials of managing a successful research site. One of its core modules is the patient database management function. This module offers easy navigation to facilitate quick and easy searches within the system based on various criteria such as gender, age, inclusive/exclusive medical conditions, BMI, and inclusive/exclusive medications. It allows you to send emails that match your search criterion to the subjects with only a single click of a button while filling out the feasibility questionnaire is easier than ever. Additionally, RealTime-CTMS comes with a robust accounting and budgeting function. This module permits you to monitor study costs, revenues, and profitability; build budget templates based on your study event schedule and more. It also allows you to generate and send invoices to your sponsors for monitored/completed visits or other clinical trials revenue items. Better still, the platform come with a patient recruitment module. The module allows you to accurately capture full medical history directly into the system before/during the patient’s visit. Better still, it’s easy to run searches within your database to pinpoint prospective subjects for new study. If you are interested in RealTime-CTMS it might also be sensible to examine other subcategories of Best Clinical Trial Management Software collected in our base of SaaS software reviews. Since each organization has unique business requirements, it is advisable for them to abstain from seeking a one-size-fits-all faultless software system. Needless to say, it would be useless to try to find such a platform even among popular software applications. The intelligent thing to do would be to catalog the various important elements that require consideration such as key features, budget, skill levels of staff members, company size etc. Then, you should do your homework thoroughly. Read some RealTime-CTMS reviews and check out each of the other apps in your shortlist in detail. Such exhaustive homework can make certain you discard ill-fitting systems and choose the solution that presents all the aspects you require for business success. How Much Does RealTime-CTMS Cost? We realize that when you make a decision to buy Clinical Trial Management Software it’s important not only to see how experts evaluate it in their reviews, but also to find out if the real people and companies that buy it are actually satisfied with the product. That’s why we’ve created our behavior-based Customer Satisfaction Algorithm™ that gathers customer reviews, comments and RealTime-CTMS reviews across a wide range of social media sites. The data is then presented in an easy to digest form showing how many people had positive and negative experience with RealTime-CTMS. With that information at hand you should be equipped to make an informed buying decision that you won’t regret. What are RealTime-CTMS pricing details? What integrations are available for RealTime-CTMS? If you need more information about RealTime-CTMS or you simply have a question let us know what you need and we’ll forward your request directly to the vendor.